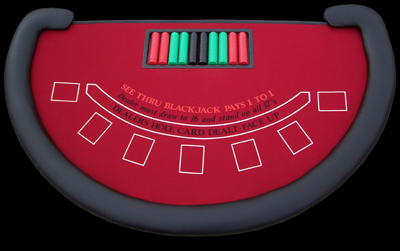 Double Exposure Blackjack (also called "See Thru Blackjack") is a variant of blackjack in which both the dealer's cards are revealed to players at the start of the hand. Knowing the dealer's hand provides players significant information, and without rules, modifications would be advantageous to the player. The main rules change to provide the casino with the advantage: (1) Even money payouts on blackjack (compared to 3:2 at normal tables) and (2) Ties lose (compared to pushing in standard blackjack). Other rule changes also exist to the detriment of players. Certain tables restrict doubling down and splitting, and do not allow doubles after splits. The game was invented by Bob Stupak, former owner of Vegas World and Stratosphere casinos. It is still currently being played at the Stratosphere. It uses material from the Wikipedia article "Double Exposure Blackjack".